Jeanne Crain and Jane Russell, showing a lot of leg and cleavage, play dual roles as brunette showgirl sisters in Paris, and their blonde mother and aunt, who were the toast of Paris in the 1920s. Despite the gorgeous costumes by Travilla and Christian Dior, the Technicolor and CinemaScope, the chic Parisian settings, and some good songs, this is a feeble farrago. The uninspired screenplay was by Richard Sale and Mary Loos - not to be confused with Anita Loos, the creator of the far better blonde version. Two showgirl sisters abandon their New York home to seek fame and true love in Paris - and discover how their mother and aunt did the same thing in the 1920s. 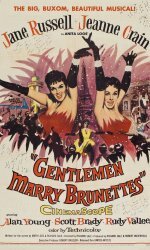 Musical comedy sequel to Gentlemen Prefer Blondes, starring Jane Russell and Jeanne Crain.